So after months of lusting after these beautiful rose golden brushes, I actually made the move and ordered them. Thank God I finally did, I'm in love and I knew I would be. The set includes 8 brushes, some synthetic and some with natural bristles and also a gorgeous little clutch to hold them in (very handy for travelling!). 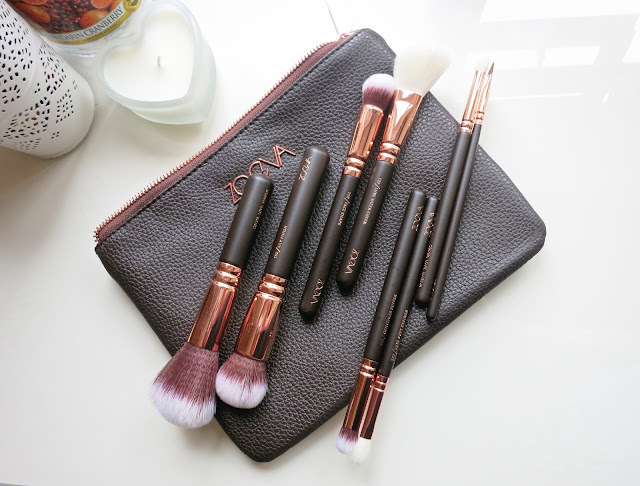 I've been meaning to buy some new brushes for a while, so naturally I was going to go for one of the most hyped up and gorgeous sets, the Zoeva Rose Golden Luxury Set £56.95. 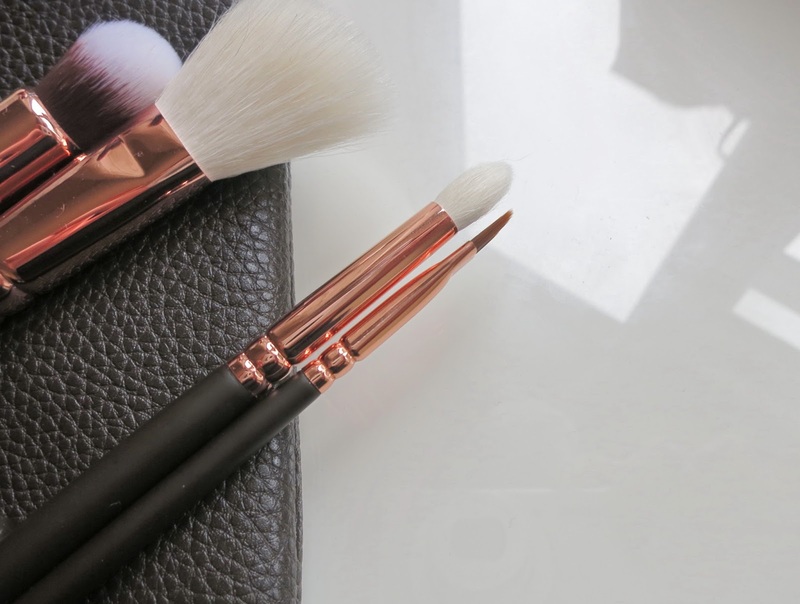 The biggest brush is the 106 Powder Brush, you can use this for your finishing powder, or even an all over bronze if that's what you're going for. I'm very much in love with my Real Techniques powder brush but I'm sure if I found this one before, this would be my go to. It's very soft and fluffy allowing an even, build-able application and also isn't too big or too small. The next brush is the 102 Silk Finish, I have been absolutely loving this brush, it makes foundation so enjoyable to apply. The brush itself is so soft, it makes it effortless to buff your foundation on. It's the perfect shape for fast and easy application. Zoeva's 110 Face Shaper is a great little brush for contouring as you can really get in below your cheekbone to add that definition thanks to it's small shape. Like all of the face brushes, it's super soft and a joy to use. 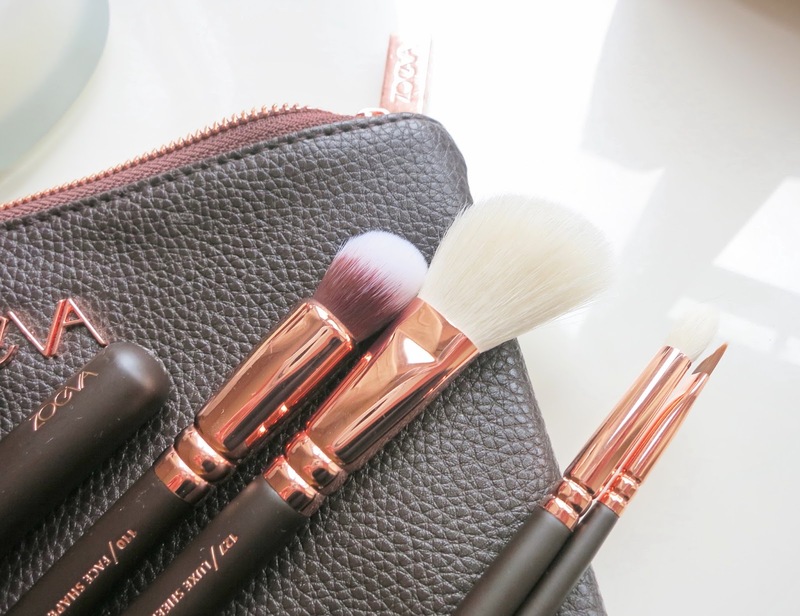 The 127 Luxe Sheer Cheek brush is another one of my favourites and I can't stop using it. It's very soft and fluffy and has that perfect angled shape to really cup your cheekbone and makes it effortless to apply your blush. It really is the perfect shape, You can manoeuvre it and use it in many different ways, under your cheek bone for bronzing, above for highlight, the list really is endless. The 142 Concealer Buffer is a great little brush that can be used in so many ways. I use it to buff in my concealer, focus on those trickier places like the crease of your nose and also under the eyes too. You could probably also use it as a base brush for your eyes to sweep on your base colour, all across the eye. Next up is the 227 Luxe Soft Definer, This is one of the brushes I was most looking forward too as a kind of replacement for my MAC 217 as I use it all the time! 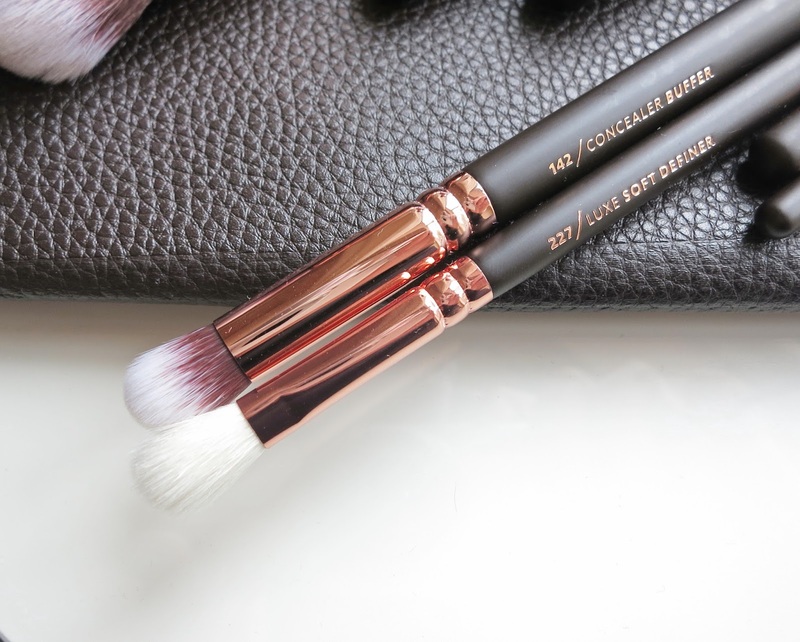 It has the great fluffy tapered end, that's perfect for applying and blending your eye-shadow. I've really enjoyed using this brush and it's so gorgeous and soft too! The 231 Luxe Petit crease is next up. This can be used to apply and blend shadow in your crease, I also use it under the eye too, to frame the eyes. It would also be great for concealer. The last brush up is the 317 Wing Liner brush. Now this one I haven't actually used yet because I'm still obsessed with my Soap & Glory Supercat and I wouldn't need this brush. I apologise for my photography skills as this photo doesn't show the angled shape of this brush. I don't have the patience or confidence to apply liner with a brush, but I'm sure this would be a great one to try out for you talented beauties! This set has not let my high expectations down, I really love using these I use them everyday. They're great quality brushes and so soft and fluffy, making them so easy and effortless to apply your make-up. My favourites are the Silk Finish, Luxe Sheer Cheek and the Luxe Soft Definer. If you have been wanting to try these then you really need to bite the bullet and go for it, you won't regret it! You get so much for your £56.95. Zoeva also have a new gorgoeus Rose Golden 2 set that has the same beautiful rose gold but with a gorgoeus pale pink insead of the brown. I was going to go for these but decided I would use these brushes more as they have slightly different brushes. Check them out beauties you'll love them! Don't forget to enter my giveaway for a chance to win a gorgeous NARS blush beauties! 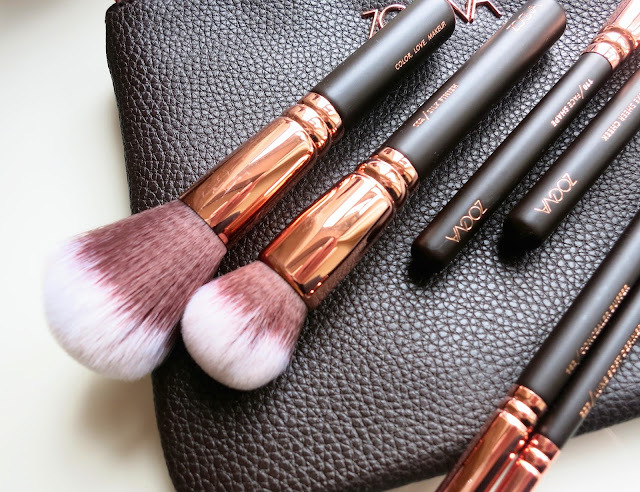 These brushes are beautiful! I've never tried any Zoeva brushes but i only here good things about them. I love Zoeva brushes, I have the eye set in pink and I'm obsessed with them. Glad you love yours.